Hoist safety is an essential part of minimizing the risk of injury when using scaffolding. If scaffolding and a hoist are part of your construction site, some basic safety guidelines will keep everyone safe. When you’re using hoists for your construction project, keep these rules in mind. Before each use, the hoist should be examined exactly as recommended in the operation manual for the specific hoist that you are using. All job site hazards should be identified, inspected, and secured before work begins using the hoist. Never allow any passengers into the hoist until the pre-start inspections are complete. In addition, hoists should be inspected at least every 90 days by a representative who is trained in evaluating the specific hoist you are using. If this inspection is overdue, the hoist should not be used. Every hoist has specific weight load guidelines that are listed in the operation manual. Check the guidelines before operation and never exceed the recommended load. Every person responsible for operating the hoist on the job site should have access to the manual to verify this information. All passengers, operators, and materials should be loaded onto the hoist before it is in motion. Check the weather forecast at the start of each period of operation. Do not operate, put together, or dismantle the hoist when there is a lightning storm occurring or when winds exceed 30 miles per hour. Discontinue operation in advance of approaching storms. Someone who is under the influence of alcohol or drugs, including over-the-counter medicines that can cause drowsiness, should never operate the hoist. 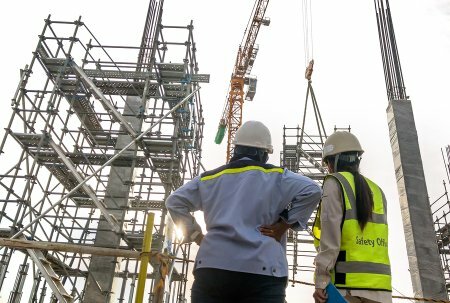 Scaffold Resource offers project management and safety consulting services to ensure that your job site meets OSHA standards and keeps your workers safe. Contact us at (301) 924-7223 for more information about scaffold rentals and sales near Washington, D.C.
At Scaffold Resource, our philosophy is that we should always go above and beyond what is expected of us. If you look at our engineering services , you’ll quickly realize that we could not be more dedicated to our work. If you’re thinking about taking advantage of our engineering services, read on to see what you’re in for. There’s no single solution that can be applied to every construction and engineering project. You have to think about the specific requirements of the task at hand and decide how you’ll overcome them in order to get the job done efficiently. The team of expert engineers at Scaffold Resource has the experience and creativity to take on any project, regardless of how complex it may be. We start with project consulting and field analysis, and then we work on scaffold design and engineering. Before you know it, the platform will be erected, and we will follow up thereafter. 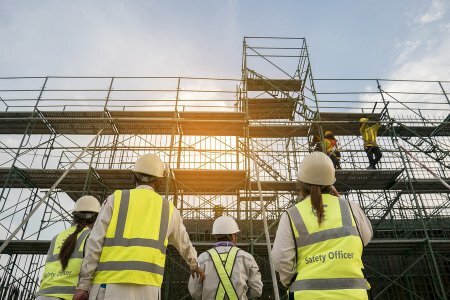 Scaffold Resource’s scaffolding engineering services in Washington, D.C., will help to ensure that your project is done safely and in a timely fashion. We offer different types of work platforms and services, and you can learn about them on our website or by calling us at (301) 924-7223. There’s plenty to see and do when you visit the Smithsonian Arts and Industries Building, and the Katherine Dulin Folger Rose Garden is a main attraction. Professionals used scaffolding to bring this building and its garden to life, and now we get to enjoy both. Watch this video for a closer look. There are somewhere between one and two hundred species of rose, but there are thousands of hybrids. The Alnwick Rose is named after the Alnwick Castle, where James Smithson’s father lived as a duke. Roses are primarily grown for their beauty and their pleasant aromas, but rose oils and water have their purposes as well. Scaffolding rental in Washington, D.C., makes beautiful projects possible, and the Smithsonian is an example of one that the Scaffold Resource team has worked on. Call us at (301) 924-7223 if your business needs work platforms like scaffolding. We want to help you in any way we can at Scaffold Resource, whether that means offering scaffolding rentals or designing shoring systems. Our project management services help complete your task within your timeframe thanks to our professional expertise, knowledge of safety practices, and the quality of our products. Continue reading to learn about the benefits of our project management services. A project manager helps oversee the job to make sure it’s done properly and according to the industry rules and regulations. If you’re expanding an existing building or constructing a new one entirely, you need professional insight in order to prepare for the job. You can ask the Scaffold Resource team anything you want to know, and we’ll ask you what we need to know so we can help to the best of our ability. When you need work platforms like scaffolding or shoring equipment for a job, you want to make sure the equipment is in perfect shape. Scaffolding needs to be inspected before every use to make sure it’s safe, and a competent professional needs to be the one to do the inspection. Our team at Scaffold Resource has years of experience under its belt, and we use what we’ve learned in the industry to create nothing but the safest work platforms we can possibly offer. We can walk you through the entire project while maintaining OSHA standards, keeping people safe throughout. 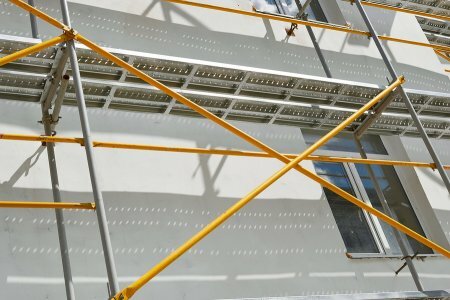 Since Scaffold Resource specializes in scaffolding and shoring materials, we have a leg up when it comes to choosing the right equipment for the job. If you’re not entirely sure what you’re looking for, seek our project management services for help. We’ll speed up the process and help you decide on the right scaffold and shoring options, and we can rent out our equipment so you don’t have to buy your own. Do you have any questions about what you can expect from Scaffold Resource’s project management services? Call (301) 924-7223 so we can answer them for you. Our website looks at our sidewalk canopies, shoring systems, and scaffolding rentals serving Washington, D.C. The Scaffold Resource team can help your business with the right kind of scaffolding rental, but there’s much more to us than that. We offer shoring rentals as well, in addition to other types of work platforms. We’ll do as much research as we need to learn about your project and provide you with the perfect equipment to stay safe on the job. Here are some frequently asked questions about our shoring project services. Can we rent our equipment? Unless you plan on physically expanding your business headquarters over a long period of time or you’re in the construction business, you don’t have to outright purchase your shoring equipment. Scaffold Resource would be happy to rent you the work platforms you need in order to get the job done. We can rent out whatever kind of shoring materials you’re looking for, so you can save money on equipment and don’t have to deal with maintenance or storage after the project is over. How do you know what we need? Every shoring project is different, so we need to know as much as possible about your project to give you the right materials. When you talk to our team about what you hope to accomplish, we can build you the right type of shoring materials. You’ll have extensive conversations with our team about the nature of the project and what kind of special challenges will need to be considered. Then we will look through our existing inventory and use our expertise to determine which materials will be most effective for your project. No matter what kind of task you’re taking on, safety should always be a primary concern. At Scaffold Resource, we do everything in our power to offer only the safest products possible. Even the safest equipment can be misused, but we create safe and high-quality products that can make it easy to stay safe at work. 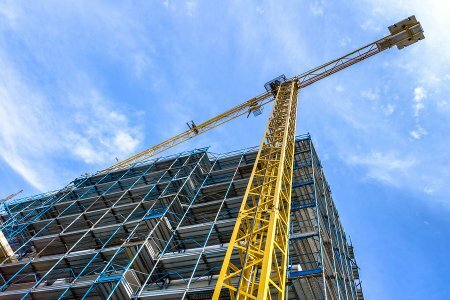 We provide businesses with both scaffolding and shoring systems near Washington, D.C., at Scaffold Resource so we can help develop the ideal shoring rental for your next project. Call us at (301) 924-7223 today.